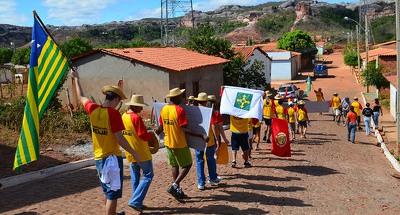 About 25 volunteers from a number of different organisations gathered today in Guaribas, a town of 4,800 in the arid bushland in the south of Piauí, 700 kilometres from the state capital Teresina. We picked Guaribas because it has one of the lowest human development scores in the state and is famous for being the place where former president Lula Inacio de Silva launched the Zero Hunger (Fome Zero) campaign in 2003. One of the first places we visited was where they were supposed to build a memorial to Zero Hunger and a cultural centre. It had been started eight years ago but was never finished. What we found was a disused building filled with broken computers, dusty sewing machines and even a room filled with text books published in 2013 strewn across the floor alongside school report cards, graduation certificates and birth certificates. We also went to see if streets that were supposed to be paved had in fact been paved and whether they now had electricity as promised. Unfortunately we were disappointed. When we went to the council offices these were shut and none of the nine representatives would meet us. We also went to the town hall but the mayor wasn’t there and no one could answer our questions. That night we invited the people of Guaribas to hear Arimateia Dantas, the coordinator of A Forca Tarefa Popular, explain how citizens can monitor what is supposed to be spent in the town. This was well-received and the volunteers on the march committed to making a plan to present to the local authorities. From 10- 24 July, dozens of people are marching from town to town in the dusty interior of Piauí, a state in the north east bulge of Brazil, to demand accountability and an end to corruption in the water sector. The march is supported by Amarribo Brasil, Transparency International’s partner in Brazil and is organised by A Forca Tarefa Popular (the People’s Taskforce). In the towns and municipalities along the way, the marchers will help the people confront their local administrations and review the public accounts to monitor spending and highlight corruption. 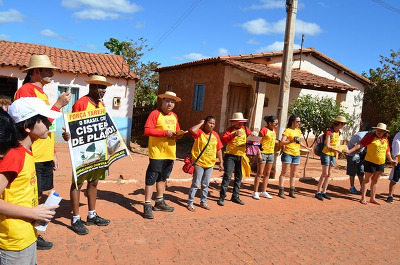 This year the march, now in its 12th edition, started in the small town of Guaribas, 700 kilometres from the state capital Teresina, to see how federal funds that were supposed to help bring water to the people have been used.